Your Way on the Parkway! Structure My Deal tools are complete — you're ready to visit Capitol Chevrolet! When people buy Chevy Colorado trucks in Salem, they gain access to many convenient tools. Some features simply the process of preparing for a trip, and others provide benefits during errands and commercial jobs. This Chevy pickup truck is designed with a CornerStep, which assists people as they prepare for a trip. The step is positioned by a bumper near strategically placed hand grips. On the road, the Chevy Colorado can tow a lot of cargo because it has a spacious truck bed with handy tie-downs. 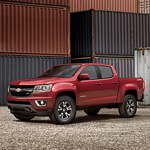 These cargo components keep heavy items totally secure when the Chevy Colorado stops after the brakes are used. Thanks to the four-wheel disc brakes and the Duralife rotors, the Colorado stops quickly after the brakes are activated. The Chevy Colorado also has sealed doors, dense windshield hardware, and other great features. At Capitol Chevrolet, you can gather information about every feature that's included with the Chevy Colorado.